At least I know the mold produced a nice part and is still in great shape. I finally have molds for both the upper and lower primary hull. Hopefully I'll have parts by the end of this weekend. The nice thing is that I really don't need to get inside for anything, so I can close the primary hull up pretty quickly. The big issue with this would be getting a nice, sharp upper lip edge. I now have primary hull parts! And the best part of this is that these two halves weigh about the same as the first lower primary hull pull I did. Still a bit thicker than it should be, but at least it is really starting to feel the part. Shaw, You are building a work of art with skill I hope to only get close to one day. I threw in a shot of the original model from approximately the same angle for comparison. The clamps aren't actually clamping in those images. 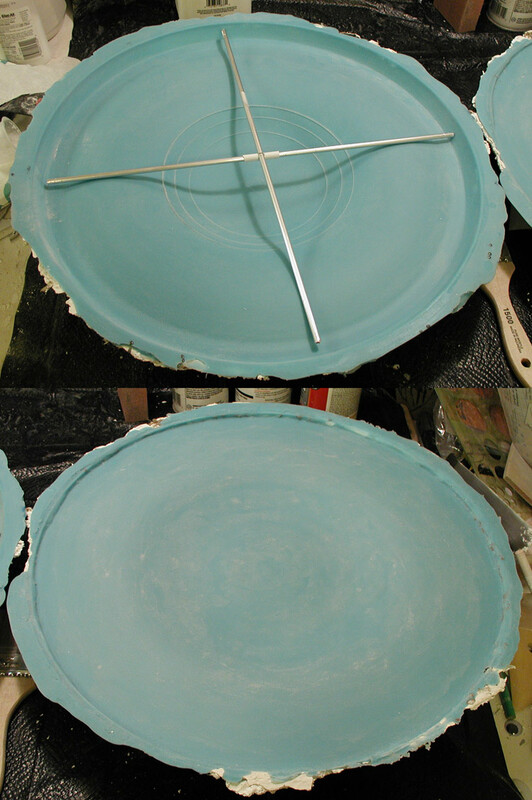 I had set them to the target thickness I was aiming for for the outer edge. They pretty much freely slide around the rim at this point. There is still a bit of refining to do, but I'm pretty happy with the results so far. ... so now I can start in on the secondary hull. 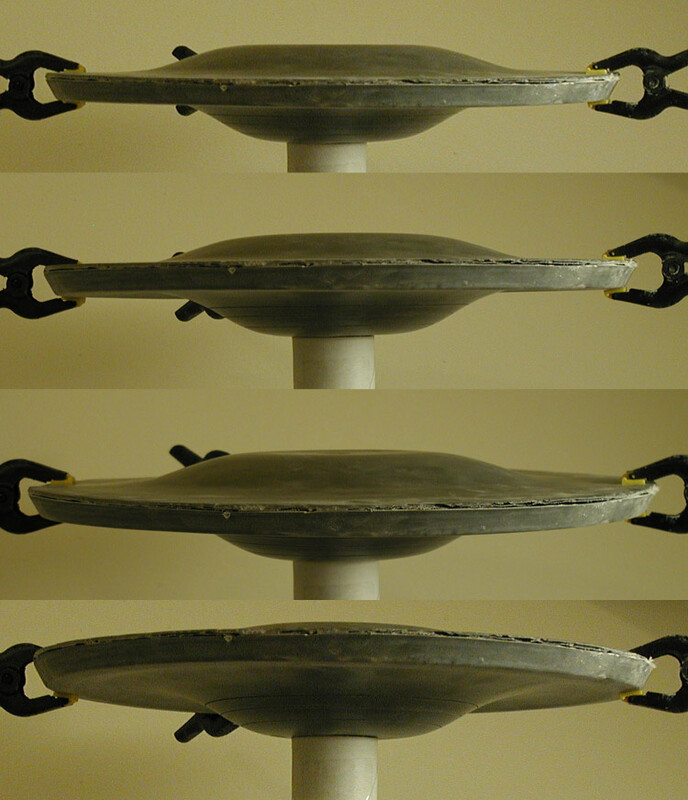 Can you describe your mold bracing method? 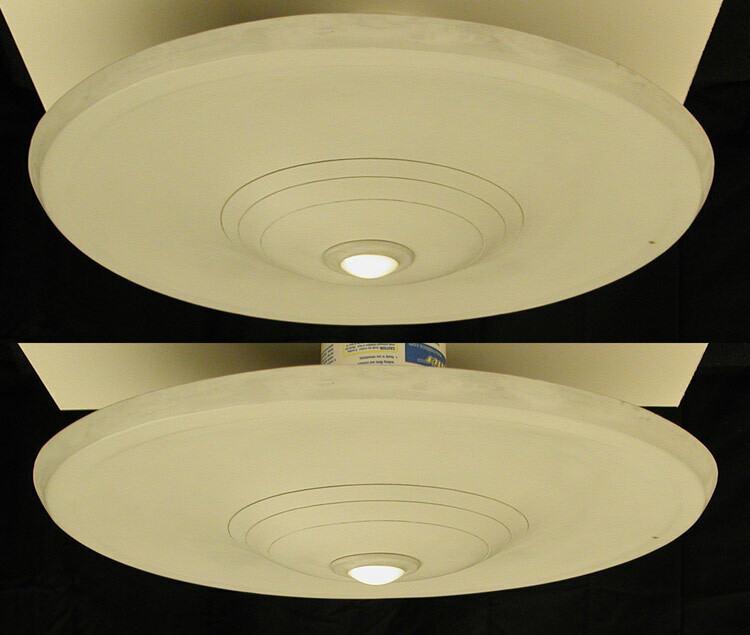 A plaster support box makes sense to me with limited undercuts, but does it also work with significant undercuts? It goes without saying your work on the kit is amazing. I'm very impressed with this so far! Amazing work! 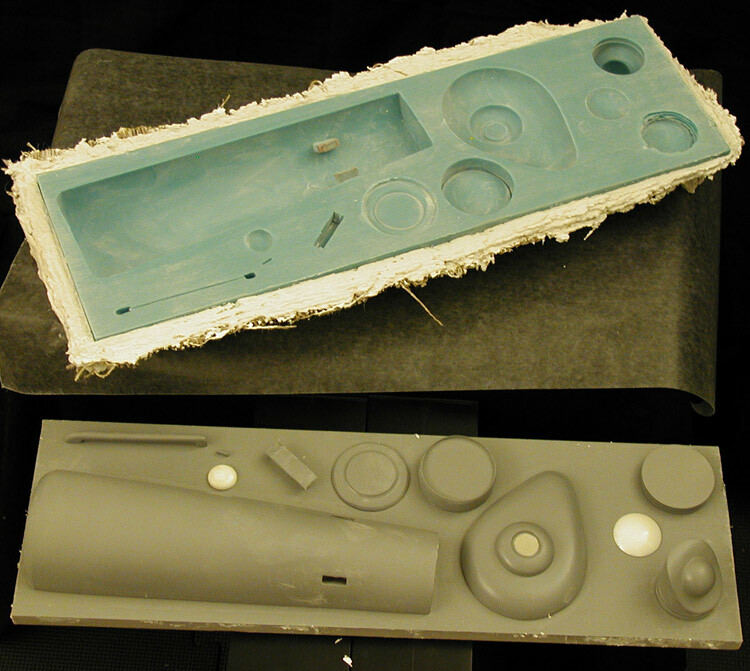 The key thing is that with large parts, even if I used a ton of silicon rubber, the molds won't retain their shape... they tend to sag. To use as little silicon rubber as possible, I brush it on in a number of layers. Brushing it up over the parts until the rubber starts to set (I usually have about 5 or 6 minutes after I'm done mixing). On the second to last layer, just before it sets too much, I place odd shaped pieces of silicon rubber from old molds that didn't work out. These act as keys for the mother mold (and the shapes are irregular to make sure everything only fits one way). I do a last layer (mostly to lock the key pieces in place) and wait for it to set up completely (two to three hours). The first plaster layer is a bit thin and is mainly to avoid bubbles. The second layer is a bit thicker, and this is the layer I lay my strips of burlap onto. The next layer is thin again to soak into the burlap. I then let the whole think set for a few days to let as much of the water out as possible. Lastly, I make a final shell layer using AMACO Sculptamold (cellulose-based paper mache)... great stuff, sets up pretty fast and gets harder over time (I found this out the hard way when I let a part I was making set too long and couldn't make any headway sanding the thing). This is the stuff I actually use inside my secondary hulls to lock everything in place. Over time it becomes rock solid and as the moisture leaves the material it gets lighter. I usually build the feet of the mother mold into this layer if needed. Yeah, it is a ton of steps, but considering the amount of time I put into building the masters, it is the best way to insure that the molds retain all that work in the parts they produce. 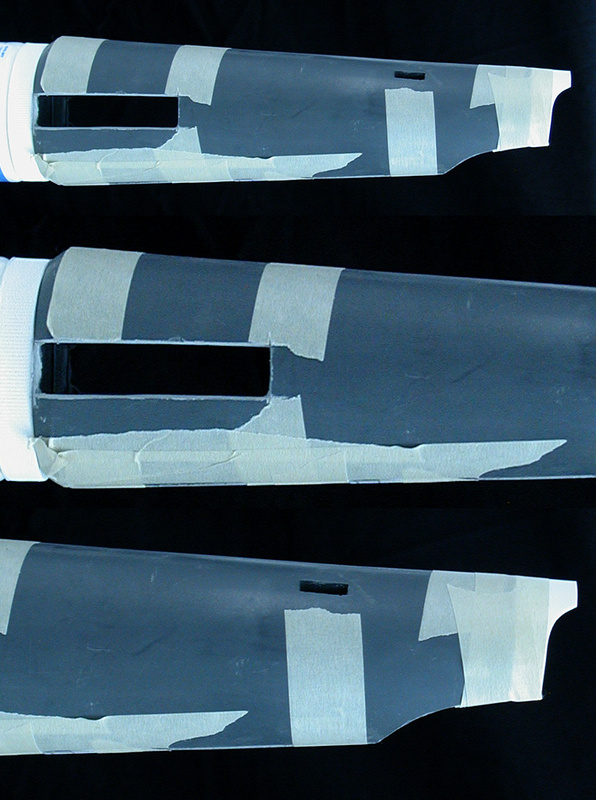 And I started on making the parts for the dorsal... this is a test assembly of them to make sure that they fit to the primary hull's contour. The goal is to replicate the model at it's most iconic period... when being used for publicity photos with the cast members during the first season. 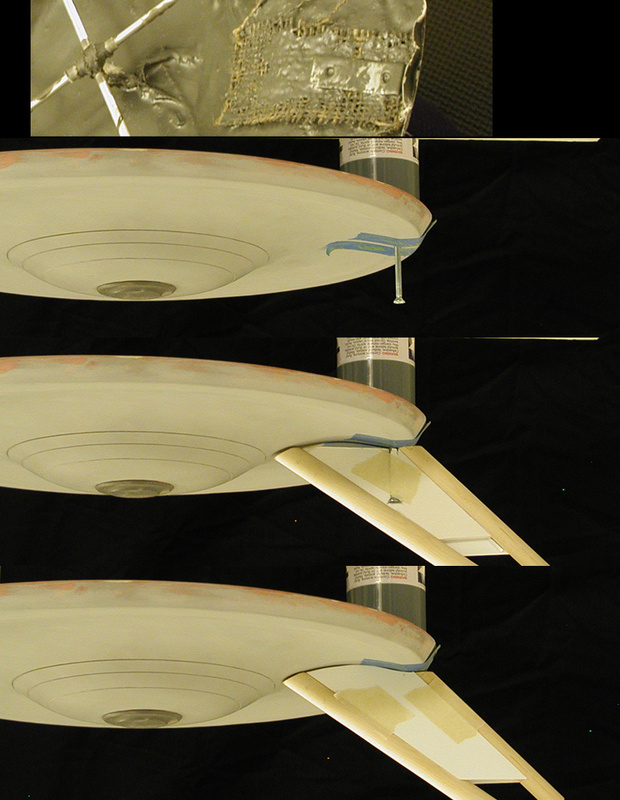 Some time between the second and third seasons the model was dropped and imperfectly repaired (the port side nacelle was re-attached wrong and the outboard intercooler on the starboard nacelle was glued on backwards) along with the hangar doors being lost. Did some trimming of the secondary hull halves an test fit them with the start of the hangar door hood. There is still a ways to go, but it is feeling like I'm making progress. 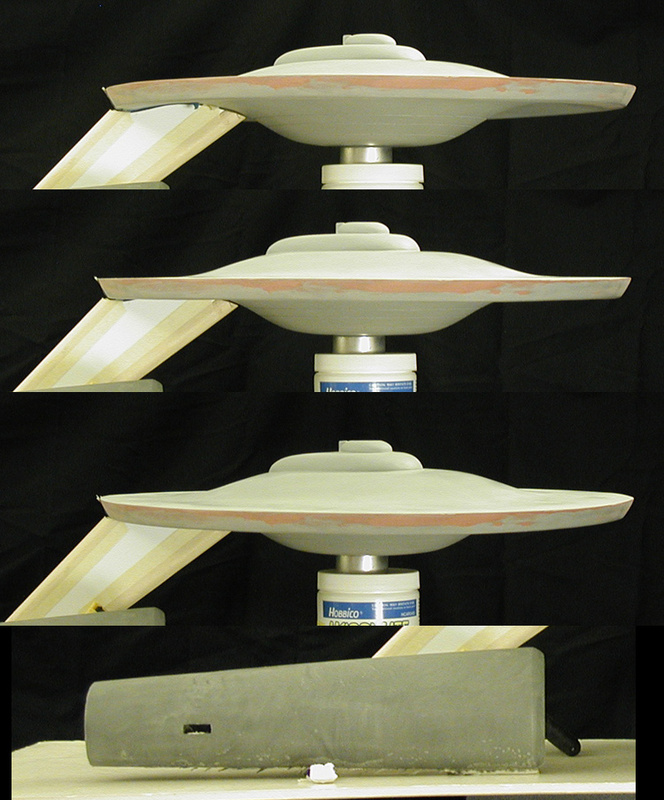 I also finished up the nacelle masters and mounted them to a board. I hit them with a couple coats of Krylon Crystal Clear before starting in on making a mold. 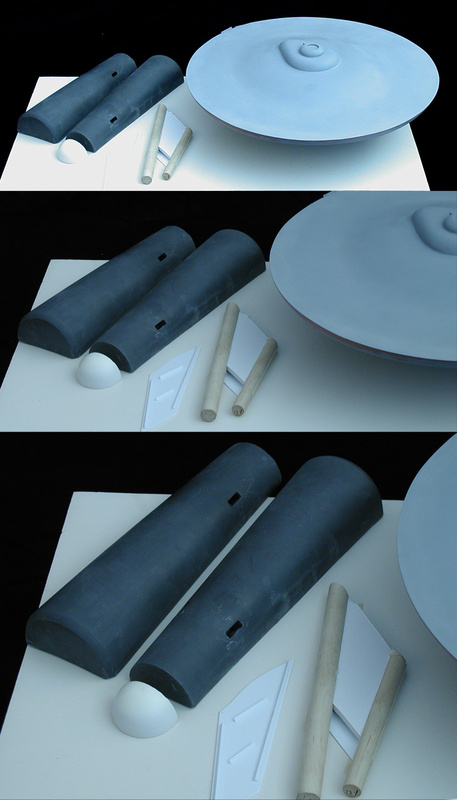 I finished up with the silicon rubber part, now just making the mother mold for the nacelles. I also did the first major cuts into the secondary hull... the rear undercut and the side channels. This is a good example of why my parts aren't kit friendly. 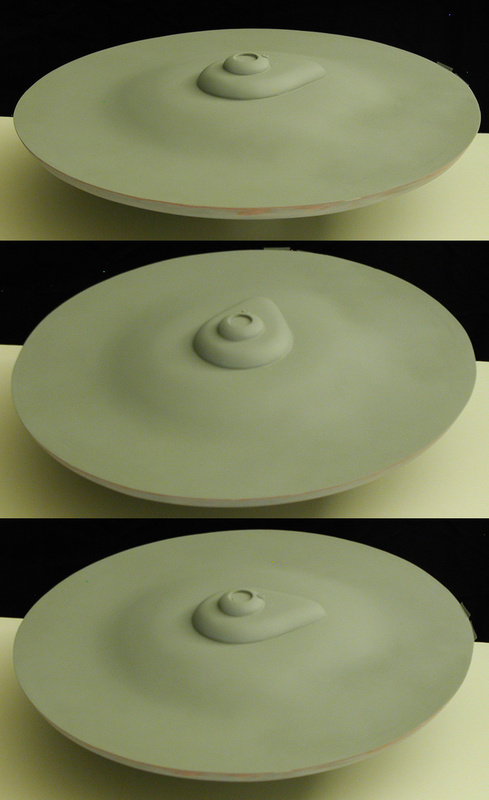 The secondary hull was no where even close to finished when I made the mold, but that was by design so I only had to worry about turning out one side to get both. And I knew what I'd have to do to finish the secondary hull as a whole. The nice thing is that I was totally pounding away at these parts, and they are very strong. They are also very ridgid...which is also quite nice. Did some more work on the dorsal today. The last major internal piece was mounting the locking screw (which corresponds to a metal plate I embedded into the lower primary hull piece back in January). I should be able to make pretty quick progress on the dorsal from here. Once I'm done with the dorsal, I'll build it into the secondary hull, locking it into place. 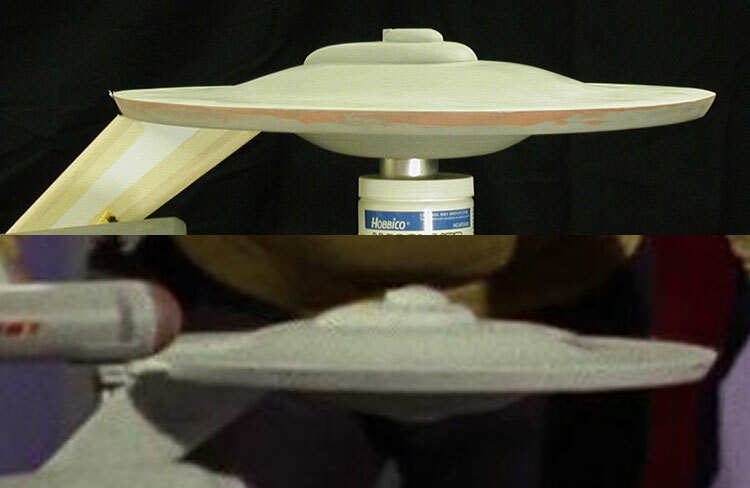 Is it me, our is the saucer a hair thin? I hesitate to say anything given all the work you've done and how wonderful it looks but for some reason it just looks thin at some angles compared to the original. Well, it is thin compared to the 11 foot model... both my one-sixth scale 11 foot study model and two-thirds scale 33 inch study model are at the same approximate overall scale of 1/500... and the rim of the 33 inch study model is thinner than the 11 foot study model. I'd have to get about three times as far away to get them to match up better angle-wise, but they don't look that far off from each other to me. And no worries, the same thing came up when I published my original plans in 2007, made my first study model in 2009, and the second study model in 2010. 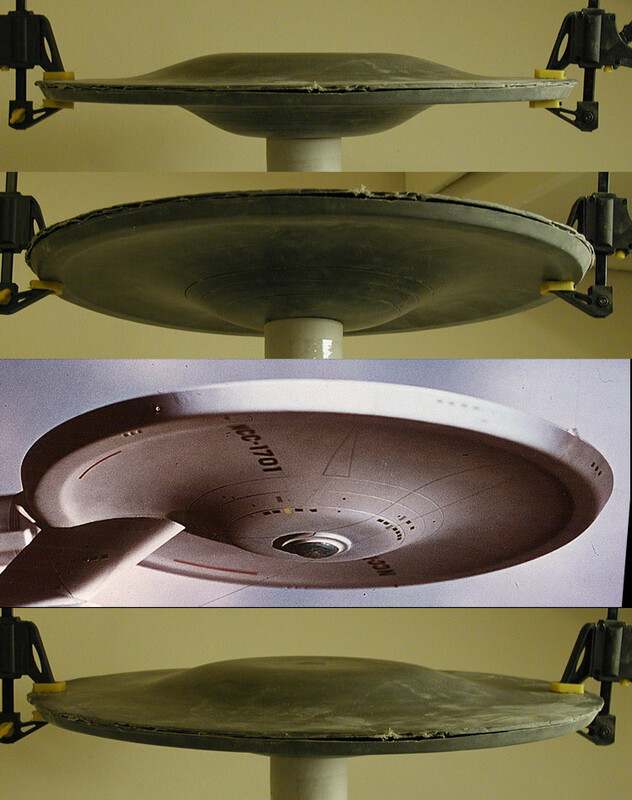 I think the reason is that the 33 inch model's primary hull was turned based on the previous plans of the Enterprise rather than the final plans, so when the rim went from a single deck to two decks Jefferies made it slightly thicker. Datin had started on the 33 inch model about four days before Jefferies had finished the final plans and Datin had already farmed out the turning of the main elements to a wood working shop.